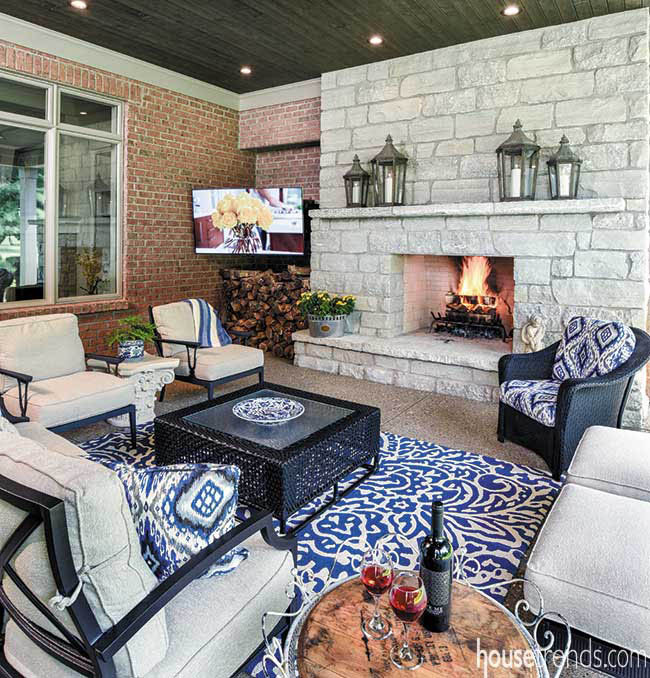 The couple moved into their new home last December and enjoyed plenty of evenings on the outdoor patio during their first summer in the home. There comes a point in life when you know what you want and don’t want, what’s a necessity and what you could do without. 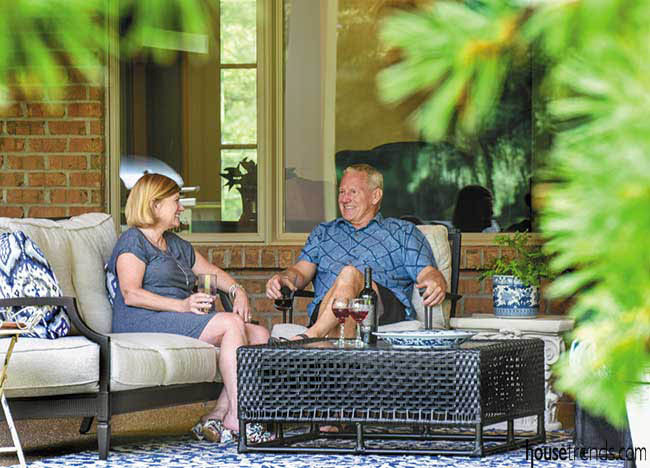 Such was the case when Steve and Margery Schnicke sat down—nearly every morning for three months—to design their new home. Steve, a builder, has constructed 15 versions of this home over the years, not to mention hundreds of others. 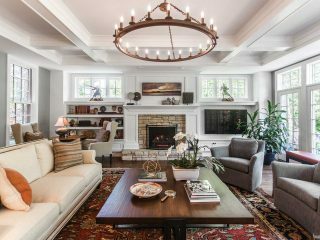 “With his experience, he had great ideas on architectural features and the structure of the home,” says interior designer Ann Hoffman of Hoffman & Albers Interiors, who helped the couple create a cohesive design. While Steve gives a shrug when asked about his aesthetic leanings, his wife has been working with Hoffman for over 20 years, and had a clear vision of the fresh-yet-traditional style she was seeking. Their home, which was completed less than a year ago, is an emblem of their new life together. They were married on the property in 2016 with Steve’s four daughters and Margery’s three sons by their sides. 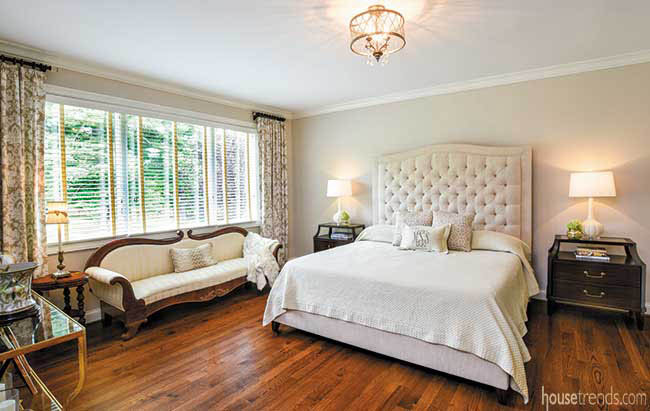 Every room unites their influences—past and present. 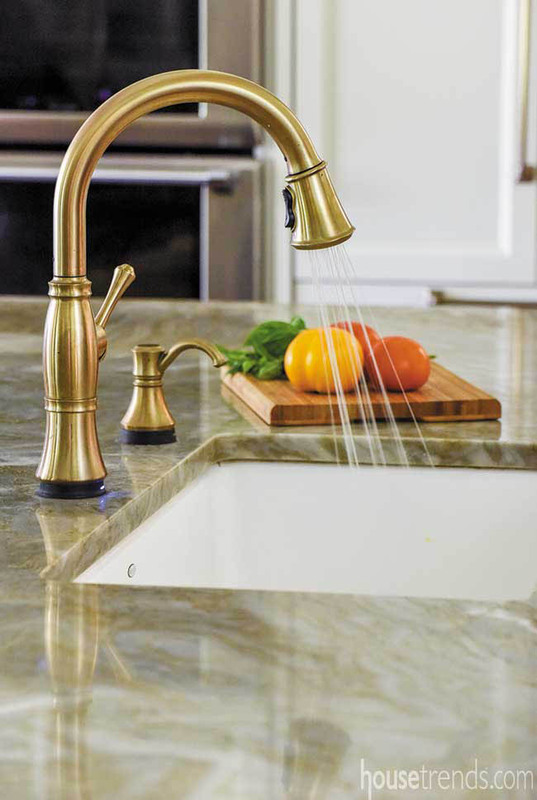 In the kitchen, the size of the massive island and the champagne bronze finish on the faucet were Steve’s ideas, while lanterns over the island are the same lighting that Margery had in her previous home. 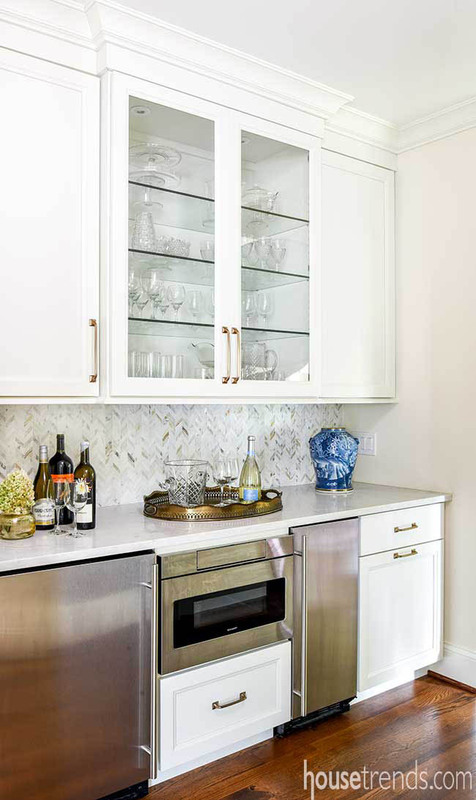 The subdued marble backsplash is a complement to zig-zag marble tile in the wet bar around the corner, which the couple saw installed as powder-room flooring in one of Steve’s projects. 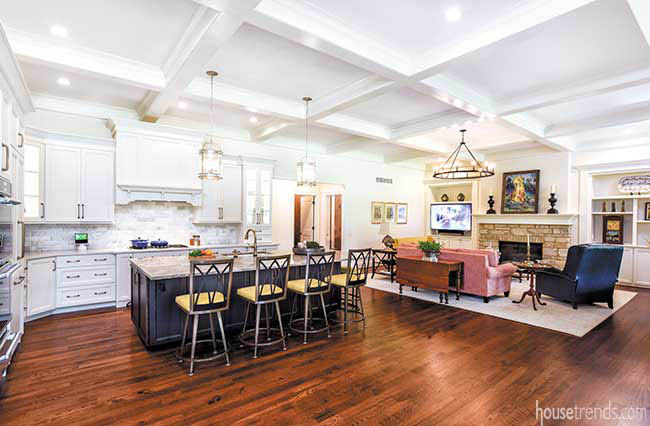 While the couple selected these finishes on their own, they needed a little help piecing together what each of them brought to the home’s design. 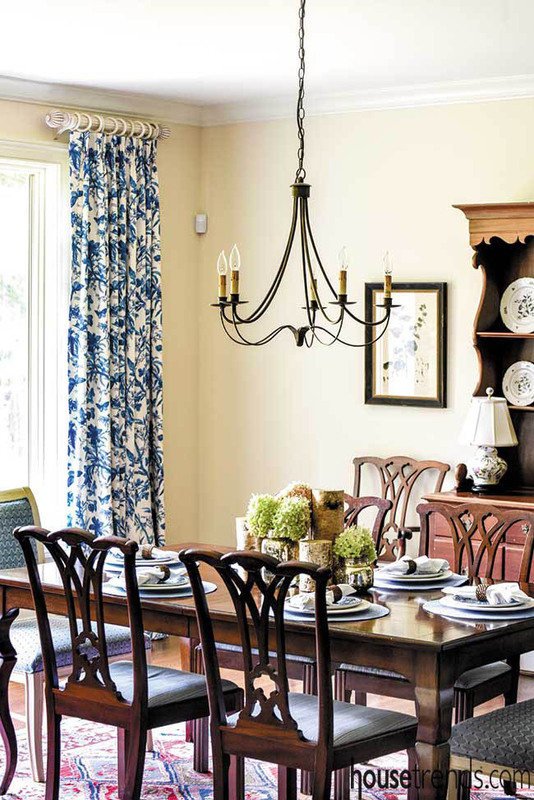 “Ann’s challenge was how to blend our (existing) furniture pieces with our new life,” Margery says. 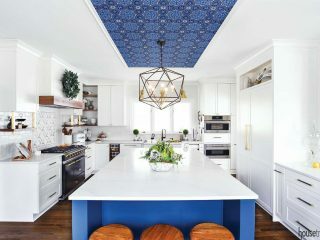 Marrying old and new, Hoffman based the home’s palette on a blue-and-white rug, with touches of red, from Margery’s previous home, and a painting above the fireplace, which commemorates a backyard bonfire on the couple’s wedding day. 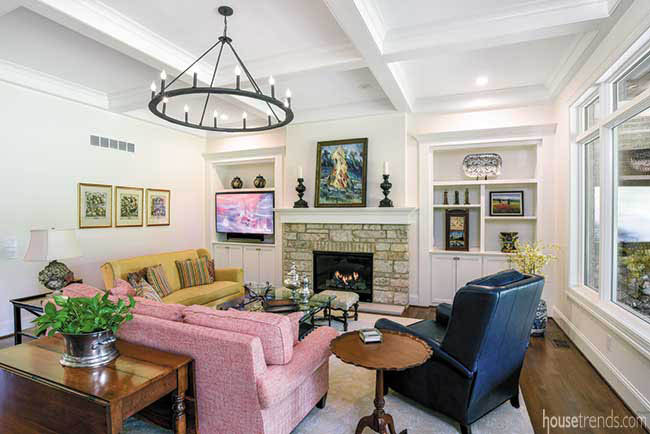 A new pale-red sofa and deep-cobalt leather recliner join Margery’s yellow sofa in the great room, picking up hues from the painting and creating a “happy, sunny room,” Hoffman says. For the kitchen island, Hoffman found stools with arching lines that mimic those on the backs of the dining room chairs, which Margery inherited from her grandparents. To fill in the blanks elsewhere, Hoffman drew from the couple’s existing stock—sometimes quite literally pulling pieces from a lower-level storage room. “A lot of times it’s not until you get in your home and have everything in place and start living with it that you see a need for something. 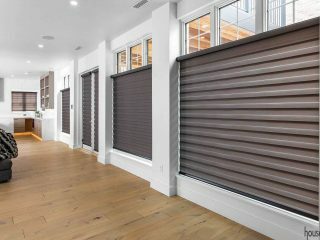 We would go to a storage area in the basement and it was amazing how many pieces we could find to refresh a space,” Hoffman says. Back in the great room, benches that previously functioned as cocktail ottomans were reupholstered for additional seating. And a desk and area rug perfectly sized for the foyer actually came from the living room in Margery’s previous home. But many of the couple’s decisions—and customizations to the house plan—rested more on function than aesthetics. They thought long and hard about how they would live in each space, and what would make it feel comfortable and easy. “I always tell people, ‘Go with your gut,’” Steve says of his clients, and the couple followed that advice. 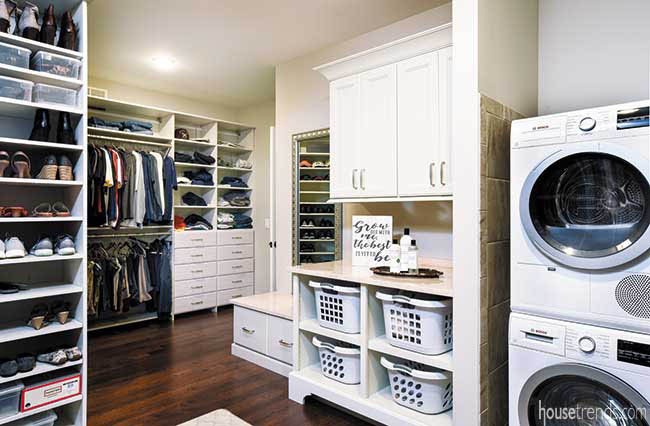 With a household of just two and an additional laundry room on the lower level, a wall separating the laundry from the master closet was simply an inconvenience. So they removed it and created an easy-in, easy-out space complete with shelving and baskets for sorting laundry, a table for folding and a built-in bench for slipping shoes on and off. 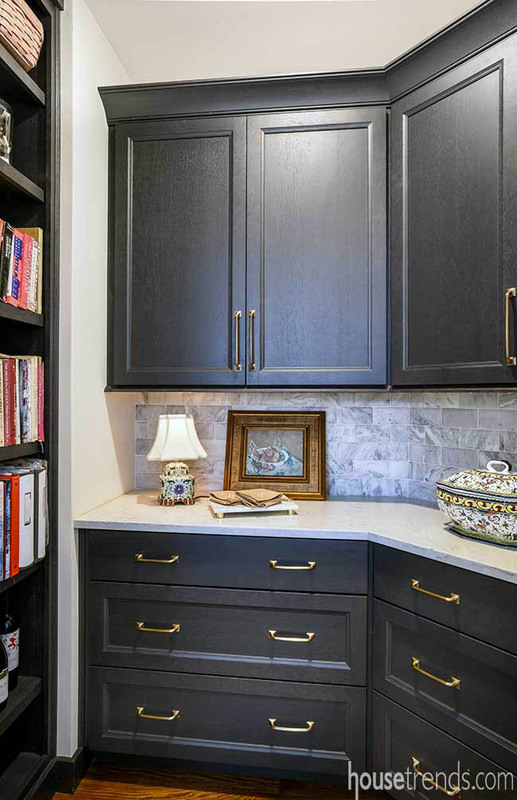 Margery, an avid cook, likewise expanded the plan’s simple hall pantry into a “fancy pantry,” as Steve calls it, to keep her dozens of cookbooks readily available. Other smartly considered details, like a toaster housed in an outlet-equipped drawer, keep daily essentials fully accessible yet fully concealed. In fact, one of Margery’s favorite features in the house is one you can’t see: a custom-built paper towel holder tucked into a kitchen wall cabinet. Chic conveniences pair with comfortable spaces, exemplifying the relaxed lifestyle the Schnickes are creating together, season by season. 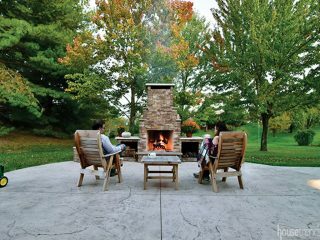 Just off the great room, there’s a cozy outdoor living room with a fireplace inspired by a lodge the couple visited in the Adirondacks. “We’re really looking forward to fall and watching football out here,” Margery says of the outdoor space.